I’ve said before that I’m not a big fan of short stories, often finding them disappointing. 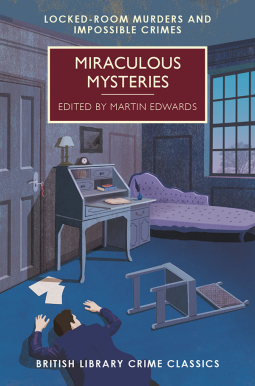 So I’m glad to say that I enjoyed this anthology edited by Martin Edwards: Miraculous Mysteries: Locked Room Mysteries and Impossible Crimes. Some stories, of course, are better than others. These are the sixteen stories in the collection. Martin Edwards has prefaced each one with a brief biographical note, which I found useful as some of the authors were new to me. I read the collection slowly, which I find is the best way to approach a short story collection. The Lost Special by Arthur Conan Doyle (not a Sherlock Holmes/Dr. Watson story) about a train that disappears on its route from Liverpool to London. This was first published in The Strand Magazine in 1898. The Thing Invisible by William Hope Hodgson, an author I hadn’t come across before. First published in 1913 this is a murder mystery dressed up as a ‘ghost’ story. Very atmospheric. The Case of the Tragedies in the Greek Room by Sax Rohmer, another new-to-me author, although I had heard of his most well known character, the master criminal Dr Fu Manchu. In this story amateur detective Moris Klaw and his beautiful daughter investigate a locked room murder in a museum, involving ‘psychic photographs’. The Aluminum Dagger by Richard Austin Freeman, featuring one of Dr. John Thorndyke’s scientific stories, describing in detail how a man was discovered in a locked room, stabbed to death. The Miracle of Moon Crescent by G. K. Chesterton, a Father Brown story set in America, in which the cleric investigates a death by a curse. The Invisible Weapon by Nicholas Olde, an impossible murder mystery, in which there is only one man who could have done it – and he could not have done it. The Diary of Death by Marten Cumberland – an impossible crime, a kind of chess problem. Lilian Hope’s diary provides a list of victims -people she had hated. The Broadcast Murder by Grenville Robbins, in which a murder takes place in a radio station and is broadcast has it happens. The Music-Room by Sapper (not a Bulldog Drummond story), featuring a secret passage and a falling chandelier. Death at 8:30 by Christopher St. John Sprigg, in which a murderer predicts the date and exact time of the death of the victim unless a ransom is paid. Too Clever By Half by G. D. H. and Margaret Cole – Dr Tancred’s advice, if you intend to commit a murder, is don’t make the mistake of trying to be clever! Locked In by E. Charles Vivian – a death by shooting in a locked room. The Haunted Policeman by Dorothy L. Sayers (a Lord Peter Wimsey story) – probably my favourite in the collection. It had me completely mystified. The policeman is new to the beat and can’t believe his eyes. The Sands of Thyme by Michael Innes (a John Appleby story) murder at Thyme Bay, or was it suicide? Footprints in the sand provide a clue. Beware of the Trains by Edmund Crispin (a Gervase Fen story), a clever and baffling story about a lost train driver. The Villa Marie Celeste by Margery Allingham (an Albert Campion and Inspector Luke story) – another favourite, in which a young couple disappear, leaving behind their half-eaten breakfast, taking only a couple of clean linen sheets. There was no clue why they left and no signs of any violence. My thanks to the publishers for my review copy via NetGalley. Hi! These stories sound great! I’m not a big fan of short stories either, but I really enjoyed this collection. The Sayers and Allingham stories were my favourites too, but I was impressed by some of the authors who were new to me as well. So glad you enjoyed this, Margaret. Edwards is such a skilled editor, I think. I agree, too, that it’s best to work one’s way slowly through a collection like that. It gives you the full sense of the collection. I am always so tempted by these British Library Crime Classics but sadly I haven’t read any yet. It is good to hear you enjoyed this collection.